Offline Reports on current 90-day transactions. A new option to request that a report be run offline offers more flexibility than is available online. With the new option, you’ll build the report you need, give it a title that makes sense to you, and notify whomever you wish that it is ready for download. The pages to define the report are similar to the Ask/Reports, but have additional features that can save, schedule, and hold reports for pick up. Request any report for a period of up to 90 days at a time. Request reports by Descriptive Code. Save up to 25 reports, with up to 5 active (scheduled or completed) at any one time. 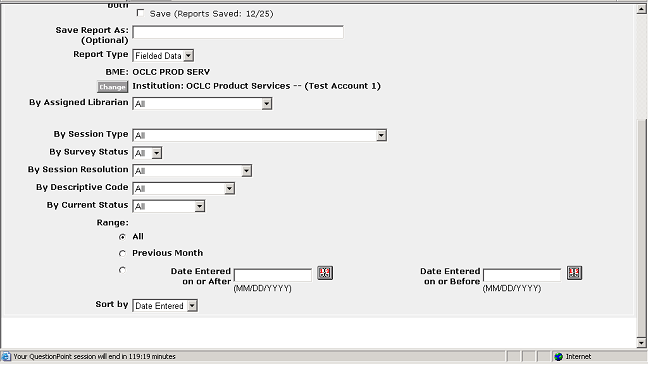 Users select limiting criteria and then the fields and report format they want. This is a two-step, two-page process. You must select Schedule and/or Save before it is possible to move on to the second, Field Selection page. Reports are run during the night (Eastern Time, GMT -4) on the replication server to ensure no impact on system performance. If you provided an e-mail address, you are notified that your report is ready for you to download. To download, go to the Ask/Reports/Offline module, click on the Completed tab, and then on the Download link. From there, follow the standard instructions to save on your hard drive. Future releases will incorporate new capabilities, including form customization and branding. Watch the QuestionPoint blog for information. In the coming months additional features will be incorporated into this next generation patron interface, including branding, form customization, page pushing and co-browse. Please watch the QuestionPoint blog for updates and to share your thoughts. 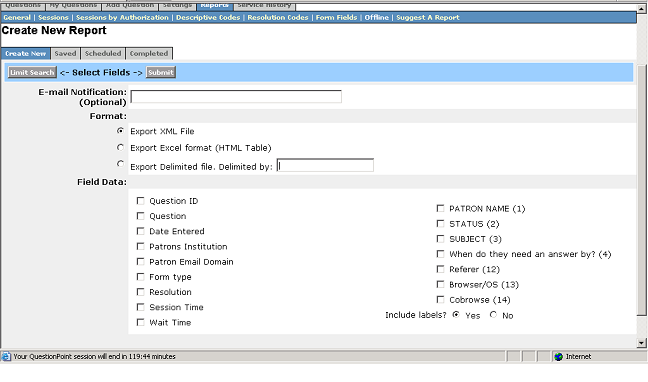 A view of the new form is available in Administration/Institution/Forms/Chat_2_(Preview). Administrators can use the URL provided there, which includes the institution’s ID, to try out the form and have others try it, or to use it as a link on the library’s web site. The form is a “production” form (i.e., it is not a practice form), so Flash-based chat users must select your Primary Queue to work with it. 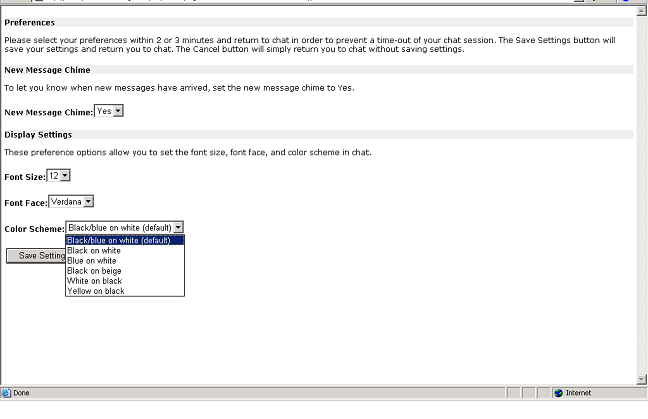 The form is currently also useable with the html-based chat monitor interface. 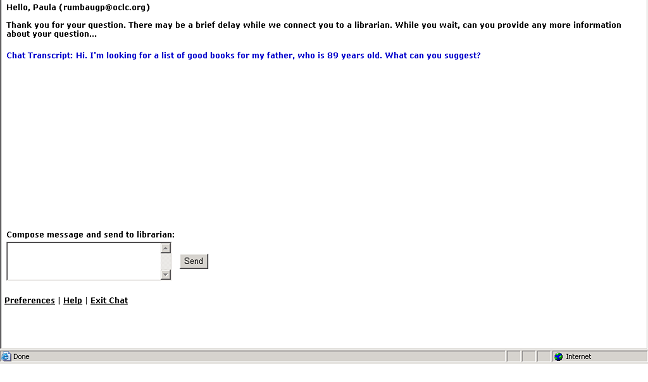 It is important to note that the librarian’s experience will be no different when chatting with a patron who is using this form. Both the standard form and this new form deliver the same experience for the librarian. And the library can link to both forms if they wish, from their portal page. The following images illustrate what the patron sees or experiences. 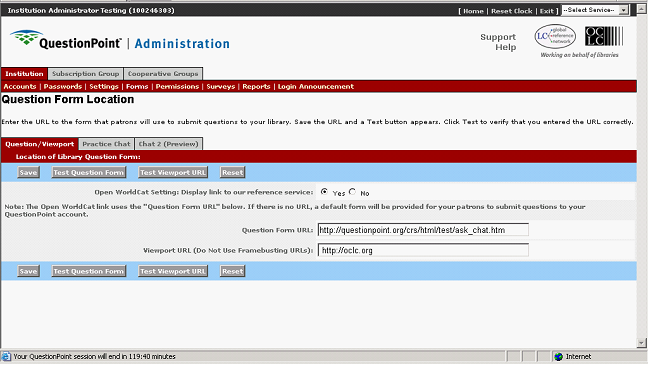 The last image shows the preferences the user may set once he has submitted his question. 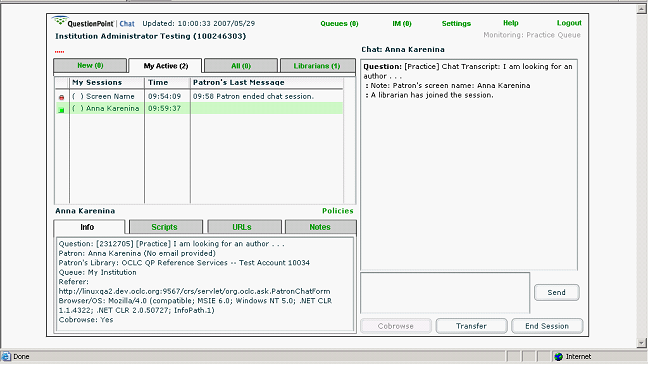 A chime alerts the user to a librarian response, so they do not need to be continually concentrating on the chat page. They can choose from 4 fonts and font sizes. They can also select different colors for the font and background, to facilitate viewing for those for whom black on white is not ideal. Administrators will see the newly renamed Practice Chat tab when they enter the Administration/Institution/Forms area. Use this form to build a practice chat form. From the My QuestionPoint home page you can test what you configure here to see how the form will appear to your users, how it will be displayed in the QuestionPoint librarian’s interface, and how the various form elements can be reported on from the reports module. 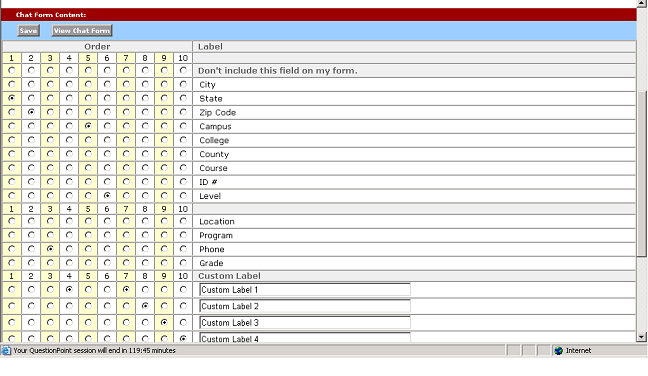 You can configure a form of up to 10 fields. If you select from the top 13 fields, your reports can be handled in a standard way, and personal identity information will be dropped when the transaction is moved to Service History archive. If you choose to include your own labeled fields, all data will be displayed and retained in the Service History. The first announcement remains the system-announcement area, where we can alert you to important events or issues. A new group announcement area will follow the systems area, if your group administrator chooses to use it. The institution announcement area will be the third, with no changes from today’s functionality. Because you may conceivably need to scroll down several times to read all the announcements, new links, showing the date of last posting, are added at the top. You can see immediately from the date whether a new announcement has been added and link immediately to it. 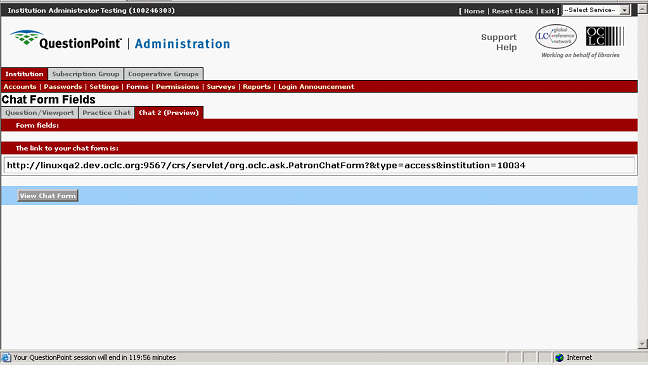 A quick link to the Administration module text entry page is provided at the bottom of the left navigation panel. 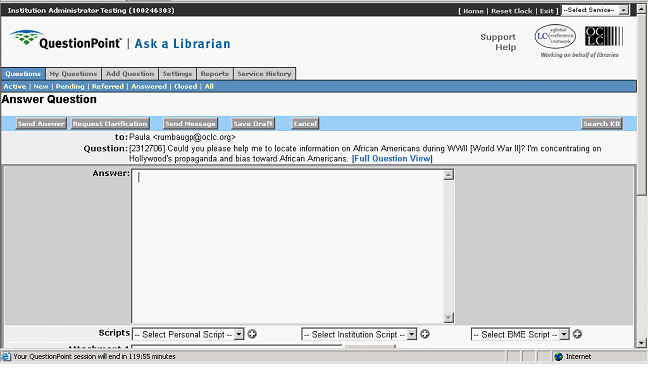 Librarians can now send information to a patron without changing the status of the question in QuestionPoint. This will be useful to let a patron know you are working on their question or that you have referred it to another library. This is done using the new Send Message button on the Answer Question page. Note: Any patron attempt to reply to these messages will be received at the library's FROM address (the address set as the Outgoing Address in the Administration module), but the reply will not appear in the question history. This insures the status of the question will not change. You may wish to set up a script, if you intend to use this kind of notification, that cautions the patron to not reply to this message. 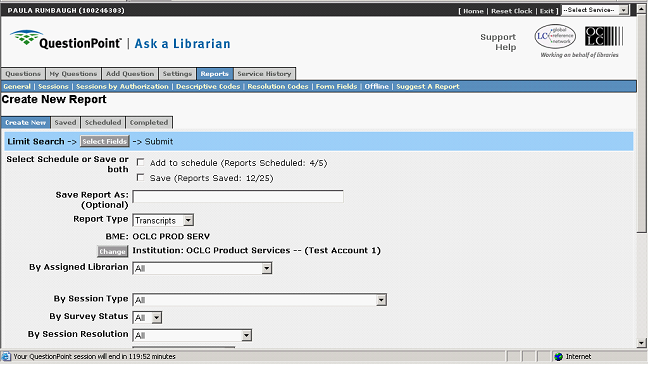 In Administration/Subscription Group/Reports/Current, administrators may select “List of Librarian Accounts” to see a list of all current librarians in the group, each with his or her e-mail address. This “report” can be exported, saved to an Excel file, and the e-mail column then saved as a distribution list in the administrator’s e-mail client. The term “anonymous” will no longer appear when the patron gives no e-mail address. Instead, “no email provided” is the indication. Heretofore, knowledge base records, when searched by librarians who are not editors or by the public, did not show the institution(s) involved in the question and no dates. With this release, those shortcomings have been remedied. The patron’s logon page will now link to Help in Dutch, Spanish, and French, if those languages are selected as the interface language. Administrators can choose to display links to their own independent survey if they wish. This allows institutions to use surveys that were specially developed for them and that may be more general in nature than a response to a single question. Please note that answers to these surveys are not brought into QuestionPoint or in any way included in QuestionPoint survey reports. All displays of timestamps now include seconds, e.g., 11:45:57. This change extends to reports, question lists, and displays of full questions/transcripts. The News feature within the QuestionPoint application has been discontinued. You will no longer see the News tab at the top of the My QuestionPoint home page. To keep up to date with QuestionPoint events, conferences, changes, and best practices, go to the blog at http://questionpoint.blogs.com. A BME administrator can once again edit the policy pages of any of the group members. 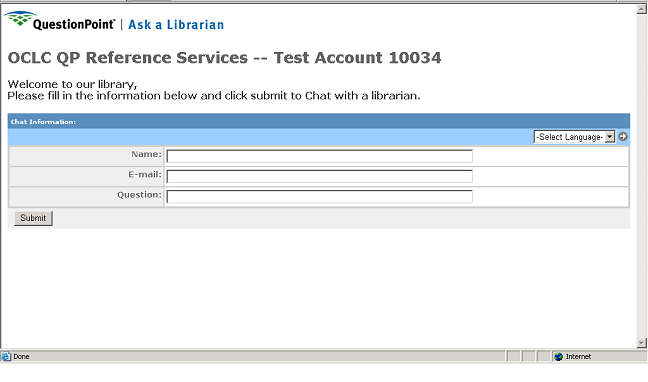 Librarians can once again export reports that are accessed via My QuestionPoint/Reports. The IP address had inadvertently been overlooked in the last release when, for statistical purposes, we saved a “shell” of records that have been deleted. The IP address has now been removed, to insure privacy. Librarians with permissions to view and/or edit their library’s profile will now see a “Search Policy Pages” link on the My QuestionPoint home page, lower left column. It wasn’t all complaints: we get lots of compliments sent to Quality too. Compliments could be placed 5th on the list if we included those. Thanks to everyone who has sent comments to Quality. Please add your comments regarding the above, or if there are issues you frequently encounter when reviewing transcripts. Please be advised that the QuestionPoint service will be unavailable for the following time periods due to OCLC systems scheduled maintenance and service: Sunday, May 27, 2:00AM Eastern (0600 GMT) to 3:30AM Eastern (0730 GMT). Please make sure to end any in-progress chat sessions prior to that time in order to avoid sudden communication interruptions to your patrons. When service is restored, please check your "New" questions lists for any interrupted chat sessions or unanswered email questions. We will provide a QP update, but we would also like to hear from you regarding what topics you would like discussed. We will post minutes of the meeting here on the Blog for those not able to attend the meeting. Thanks in advance for your comments and suggestions! As a reminder to those who would like still like to do so, the QuestionPoint feature use survey remains open until the end of business Eastern Time this Friday, 18 May 2007. .
You may access the survey at: http://www.surveymonkey.com/s.asp?u=883753124256. It takes approximately 15 minutes to complete it. If you encounter any technical problems with the survey, you have questions about its content, or you need a translated version, please contact Tom Miller at [email protected]. We would like to thank the 225 of you who have responded so far to the QuestionPoint Feature Use survey. As a reminder to those who would like to complete it, the survey closes by end of business Eastern Time this Friday, 18 May 2007. We plan to use your information from the survey to help inform us about the types of education and implementation programs we should offer over the next 12 to 18 months. To make the process easy for you, we have created an online format of 26 questions at: http://www.surveymonkey.com/s.asp?u=883753124256. Please, take about 15 minutes to answer them for us. If you encounter any technical problems completing the survey, you have questions about its content, or you need a translated version, please contact Tom Miller at millertj AT oclc.org. Thank you for performing this valuable role in helping us to shape QuestionPoint and its services. The Global Knowledge Base (GKB) is in need of QuestionPoint librarians to help review and activate submitted records! Because of your interest in supporting the work of all librarians by sharing your research and sources with them, the GKB has been growing steadily. In fact, it's growing so fast that we have a backlog of some 2,000 Q&As waiting to be edited and activated so they are searchable. Editors review submittals Q&As for appropriateness and check them for spelling or grammatical errors. They hotlink URL citations and "scrub" any personal information from the text. We do not ask editors to confirm accuracy or update information, but you are able to do so if you wish. Phone: 614-764-6433, or 1-800-848-5878 Ext. 6433.